Percent for Art Commission - CBS National School, Dundalk. 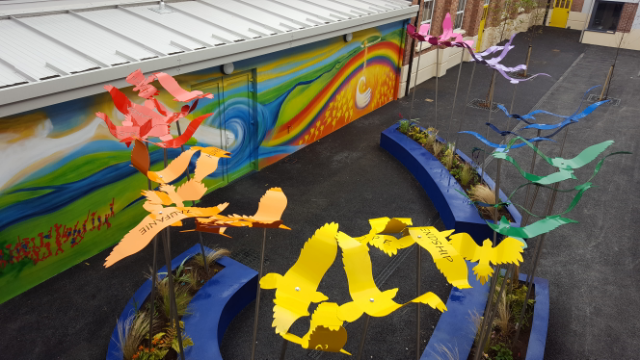 This sculptural installation is located within an internal courtyard at the heart of the CBS National School in Dundalk. The site-specific sculpture was created to give the students and school staff an inspiring and contemplative space to relax in, to learn outdoors and to provide a creative space to also be enjoyed from within the classroom on grey days when the weather prevents students from going out into the space. The sculpture installation also acts as a sensory garden and a connection to nature which will encourage wildlife to an otherwise hard landscaped area. The inspiration for this sculpture installation began with the Irish name of County Louth - Lú – which comes from the God Lugh. He was also the father of Cúchulainn. Lugh fell in love with Dechtire who was betrothed to another. He put a spell on Dechtire and her fifty maidens that put them into a deep sleep. He then made them appear as a flock of birds and flew them to Brú na Boinne. The languages featured on the birds included Irish, English, Lithuanian, Polish, Russian, Chinese, Yoruba and Portuguese. The students were involved in the concept stage of the project and their ideas and contributions were developed during drawing workshops. The large windows overlooking the courtyard gave the children the ideal way to closely oversee each stage of the installation. Finishing touches of magic were added when over 300 children and school staff took part in bulb planting. The Spring blooms are going to create a whole new layer of interest and colour within the space. I thoroughly enjoyed working on this commission - from concept and research stage, through to the planning involved when building in an internal space, while the school construction was still under way, to finally seeing the concept manifest into a finished space that is going to grow and evolve over time and offer so many different levels of learning for the students.